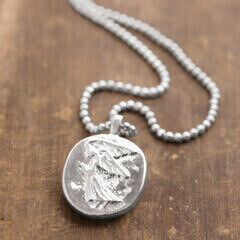 A sweet little love note in silver. 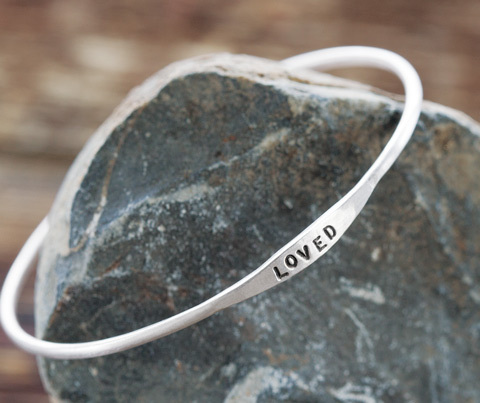 Hand made and hand stamped with the word “loved," this delicate bangle crafted from thin sterling silver measures approximately 2 ¾" in diameter and comes gift wrapped in a hand crafted wood crate with ribbon. Women's one size fits most. "Loved" Silver Bangle is rated 5.0 out of 5 by 12. Rated 5 out of 5 by Jansy from Perfect gift I sent this to my daughter who was undergoing surgery.I couldn't think of a nicer present to send! It conveyed my thoughts exactly. 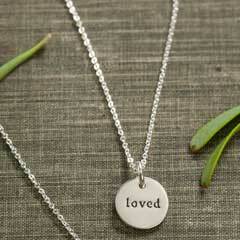 Rated 5 out of 5 by Kathymac23 from perfect gift! 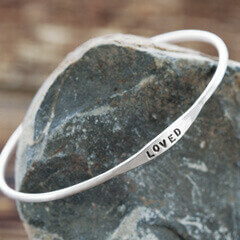 My daughter loved the bracelet- don’t we all need to be reminded that we are loved?! Rated 5 out of 5 by Lori p from Evething I hoped for Sweet and everything I hoped it would be! Beautifully gift wrapped and arrived on time! Rated 5 out of 5 by Kakid123 from Delicate and beautiful I have been wanting this bracelet for so long and thankfully I saw it come back up for sale. It did not disappoint. It is smaller than I thought and more delicate looking but that is what I like that about it. 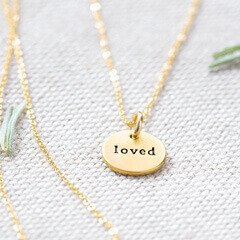 I know it says “loved” but others don’t see it as clearly. Very happy with my purchase. Rated 5 out of 5 by Skeeter from Terrific wrapping I have been sitting on this for about a month. Today I finally gave the bracelet to my wife. She was blown away and I couldn't have been happier. It was boxed in wood. Wrapped in ribbon and cushioned in shredded gray paper. 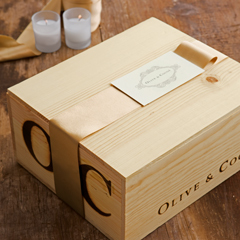 The whole package was classy and well thought out! Attention to detail in the delivery of this item was simply the best. Thanks for the extra effort! Rated 5 out of 5 by Josie from Loved it! I purchased the silver bangle for my daughter's birthday. She is very thin so I worried about whether it would be too big. No worries! My daughter is also very much of a "less is more" mindset. She loves it! Rated 5 out of 5 by Sonicchickie from I bought two of these. One I gave to my best friend. We both love them. A lot more narrow than dimensions stated. I was enthralled with the packaging while opening it. I repackaged the bracelet so I could show my significant other...so beautiful! I would have liked to see an olive colored ribbon or something...cocoa was well represented. Rated 5 out of 5 by Why a nickname from Delicate Bought for my mom, and I opened it to see it. And it was a little finer than I expected. But I like it, it's light and will be comfortable. Also it is not to big.